You know what else is unacceptable? Not telling women they have dense breasts. I don't have dense breasts. My tumor had stood out like a sore thumb, year after year. Conversely, finding a tumor in dense breasts is like finding a polar bear in a blizzard. The pictures at Dense Breast-info are instructive. See the difference? The letter -- like almost all the letters I have received and continue to receive after my own mammograms -- says that everything is hunky-dory. 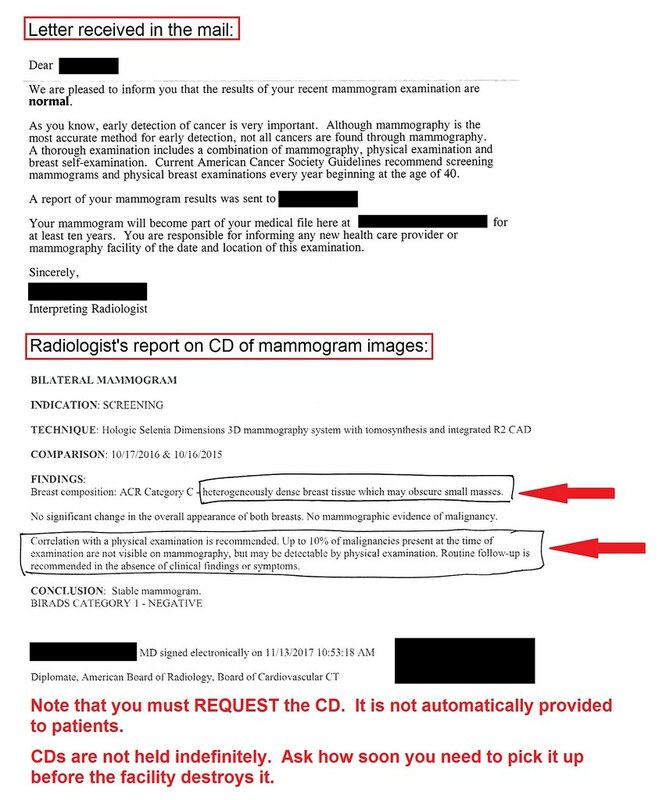 But the radiologist's report indicates that this person has dense breasts and warns that even a state-of-the-art 3D mammogram could miss a small tumor. The patient is not told this. The radiologist's report is for the patient's doctor and says, in effect, "Hey, check this one's breasts, just in case." That's not good enough. My own PCP -- who has always checked my breasts during every checkup -- had been upset because she had missed my own, stand-out-like-a-sore-thumb-on-a-mammogram tumor. And she herself is a breast cancer survivor. In fact, not only did I have trouble finding the lump once it was pointed out to me in 2014, the ultrasound tech had experienced trouble finding the lump, because it lay right against my muscle. 4. The doctor will be able to tell if a lump is present. Multiply that by the doctor's patient load. Says Dense Breast-info's legislative page, "Though some state laws are more similar than others, there is no standard from state-to-state on what patients are told or how patients will be informed." So far, dense breast notification laws have passed in 30 states, but even that is no guarantee. "If there is a state insurance law, are all women covered? NO. A state insurance law does not necessarily apply to all policies within the state. Further, national insurance providers may be exempt from state laws." "Your mammogram shows that your breast tissue is dense. Dense breast tissue is relatively common and is found in 40 percent of women. The presence of dense breast tissue makes it more difficult to evaluate the results of your mammogram and may also be associated with an increased risk of breast cancer. This information is given to you so that you will be informed when you discuss your dense breast tissue and other breast cancer risk factors with your health care providers. Together, you can decide which screening options are right for you. A report of your results was sent to your primary physician." Perhaps the best-known advocate for dense breast notification is Joan Lunden, whose cancer had been missed by a 3-D mammogram but was found on an ultrasound. She has spoken on Capitol Hill on this matter. I've been making a lot of calls to my legislators this year. I now add one more to my To Do list: urge my state senator to support Florida SB 164. Speaking of advocacy, the breast cancer community lost a giant this month. You can read my tribute to Beth Caldwell here. In other news, I have now been on anastrozole for three years (short a few days). My prior entry detailed severe fatigue as a new side effect, remedied by B-12 shots and now by B-12 sublingual supplements. Another new side effect is tenosynovitis, an inflammation of the tendon. I had been experiencing symptoms since around June, but was able to manage. Rather than make a special appointment with my PCP, I quizzed my oncologists as my checkups with them came up. The moral of that story: sometimes a PCP can best a specialist, hands down. I had first seen my radiation oncologist for my regular semiannual checkup. His guess was a neuroma: scar tissue on a nerve. My medical oncologist was next at bat. He guessed arthritis, which was incorrect, but he also pointed out the inflammation caused by anastrozole, which was correct. Judging from his reassurances, he also seemed to think that I was worried my new wrist pain was cancer, the possibility of which had never even occurred to me. Then I had my regular checkup with my PCP. As soon as I raised my hand and said, "It hurts when I do this" (stretched my thumb out to the side), she quipped, "Tenosynovitis." Complete confidence, no hesitation, unlike the guesses posed by my oncologists. Mystery solved. As soon as I gave an update over at WhatNext, two other people on anastrozole chimed in. Inflammation from the drug had given them that same condition. So, my medical oncologist had been half-right, but my PCP had hit the home run.